By Scott Gilfoid: David Haye is gleeful about his fighter George Groves’s recent win over James DeGale, and sees it as the beginning of what could be big things ahead for the young 23-year-old Groves. Haye doesn’t want Groves to fight a rematch with DeGale after Groves won the fight by the close scores of 115-114 and 115-114 and 115-115. That’s not really the kind of scores where you can get a big bump up in status, which is why it seems funny how Haye and Groves are acting as if this was lopsided win instead of a razor thin one. Since Groves doesn’t want to fight DeGale again until both of them are fighting for or defending a title, the chances of them fighting again anytime soon are extremely remote. The money they could make fighting each other, however, is a lot more than they could get fighting someone else. The only way Groves can get the kind of payday he received against DeGale is if Groves goes after a really big name in the super middleweight division like Andre Dirrell or Mikkel Kessler. And no way will those guys fight him, and I doubt Haye would be interested in throwing Groves to one of them. Okay, let’s look at the reality here. Groves is going to get some offers, but we’re probably talking about domestic level guys. Who cares about that? Is that step up from DeGale? Is fighting local guys going to bring the kind of money a DeGale rematch would? Of course not. And there is no way on earth that Groves is going to be put in with a world class opponent next. Can you imagine what a fighter like Sakio Bika, Peter Quillin, Daniel Jacobs, or Dirrell would do to him? I suppose they could pick out a bottom feeder for Groves to fight at the world level but the pickings are mighty slim and I don’t see Groves getting much credit if he knocks off someone that has already had his bones picked clean by someone else. That’s probably what’s going to happen. They’ll select a non-threatening guy that was recently beaten and is technically a contender and pick up a soft win. 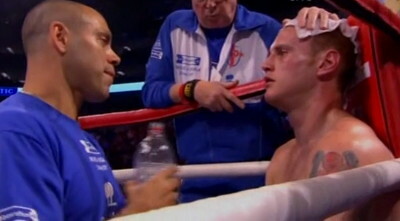 It won’t bring in DeGale-like money and it won’t help Groves in the long run. They can match Groves with bottom feeders or domestic/European level guys for the next 10 years, but sooner or later they’re going to have to put him back in with DeGale and when that day comes, I see things going badly for Groves. This is why he might as well get it over now. It’s like putting off a dentist appointment for a bad toothache. You can take the pain by making the appointment now or wait until the tooth needs to be pulled completely.